What is She Shreds Mountain Adventures! She Shreds offers the ultimate backcountry adventure! Wether it be an all girls snowmobile clinic or a men's getaway weekend on sleds, we are the definition of a good, safe time! Julie-Ann Chapman started She Shreds 7 years ago, the first all girls snowmobile clinics in the world, with a passion and dream in mind: teaching women to to progress their skills at snowmobiling in a fun and safe setting. Since then she has branched out and started taking men on backcountry adventures as well as teaching avalanche courses. We design our clinics and rides with a big emphasis on safety. 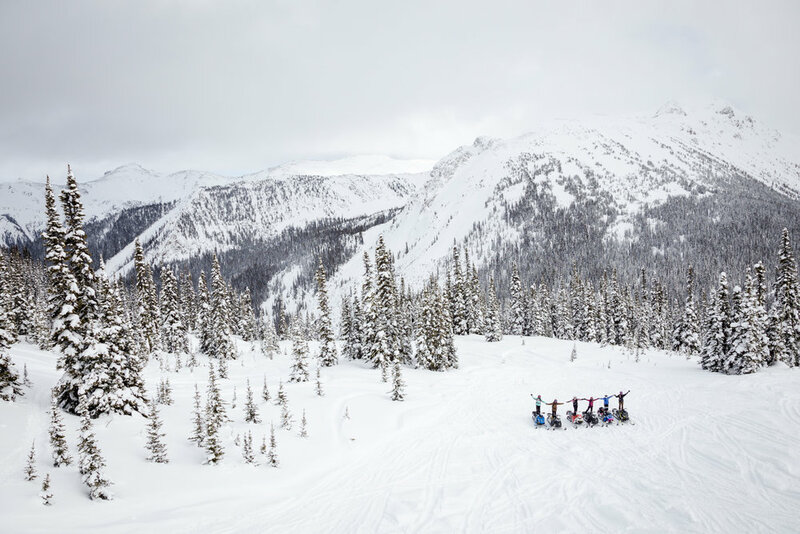 Clinics and rides are based in Pemberton BC but offer sledding all over British Columbia Canada, United States and Canada. Advance the rider to their own "next level"
Wether you only have a day to come and do a clinic/ride or if you have multiple days, I will guarantee that your current skills and confidence on a snowmobile will progress 10 fold. You will experience some of the most beautiful riding and best snow in the entire world. The Whistler/Pemberton area is a hidden gem for snowmobiling and you will understand why when you get here. "Snowmobiling has always been a passion of mine since I was a little girl growing up on the east coast of Canada sledding with the family. I moved to the mountains of BC 12 years ago and since then my passion for snowmobiling has boomed! I wanted to share my passion with people so decided to start She Shreds Mountain Adventures 6 years ago. Teaching women how to progress in the sport has been beyond fun! Bringing people (men and women) out on fun adventures in the backcountry has brought me to some of the most beautiful pristine places on this earth! I am based out of Pemberton BC, which has just recently been awarded the best place in BC to snowmobile in! I also travel all over BC to teach - Revelstoke, Scotch Creek, Whistler, Squamish, Valemount, Golden, and now go to Quebec and the United States. Safety is always #1 on my mind when I am taking clients out in the back country. I have been published in over 15 snowmobile magazines across the world and have just recently been awarded from the House of Commons of Canada the BCSF Snowmobiler of the Year. I am so fortunate to see where my passion for the sport and my business has taken me.. Come out and have some fun on your sled with me and the She Shreds Mountain Adventures crew!"